There was a fatal car accident in our town over the weekend. A lady and her nine year-old grand daughter were sitting at a stop light when a car driving the opposite direction, lost control and struck them. The grandmother was killed instantly, and the little girl died later in the hospital. My wife texted me this morning with these words. "[She was] just sitting there minding her own business... That quick one of us could be gone." I've been thinking about her words all morning, and about a conversation I had with one of our church's elders yesterday. "Where is God when bad things happen?" I've written about this pretty extensively over the past year, but it bears repeating that I believe God is in the midst of our suffering, with us in the moments of pain, tragedy and heartache--just as I believe God is with us in our moments of triumph, joy, happiness and success. 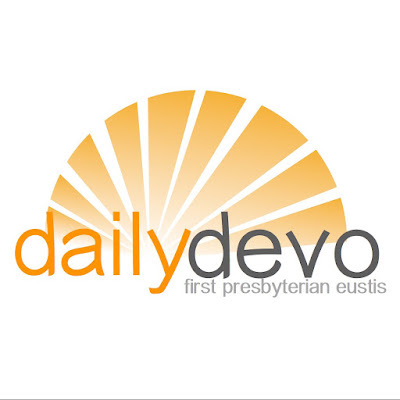 When I answered the call to become the Pastor of First Presbyterian Church of Eustis over eight years ago, I had no idea what an incredible journey that God had in store for all of us, nor did I know what great challenges we would face together or the successes we would share. God has done amazing things in these past eight years, and I am privileged to have had a front row seat to all of them. It’s been an incredible honor to serve as your pastor and C.E.O. (Chief Enthusiasm Officer). I was born with congenital glaucoma, which affects 1 in 100,000 or so people, and now is easily detected and treated. In 1969, however, there were only two people in the entire country who were able to perform the necessary surgery to reverse the effects. Because it was caught in time, the damage caused by the glaucoma was able to be minimized in my left eye, but my right eye was not so lucky. I've been legally blind in my right eye for my whole life--able to make out shapes, colors and some peripheral vision, but not much else. From time to time I run into things because I'm looking a bit too far to the left. It happened the other day, in fact. I face planted into a pole while I was walking on the street trying to figure out which way I was going. Luckily no one was there to see it. In his fantastic book, A Long Obedience In the Same Direction, pastor and author Eugene Peterson writes about the idea of faithfulness and discipline when it comes to living the Christian life. "Hoping does not mean doing nothing. It is not fatalistic resignation. It means going about our assigned tasks, confident that God will provide the meaning and the conclusions." I read this quote the other day about "being ready" from Tim Fargo, a writer and blogger. He wrote, "Opportunity doesn't make appointments, you have to be ready when it arrives." I like that quote even though it's one of those quotes you usually see on a placard somewhere at a leadership conference, or a motivational poster on someone's office wall. It's simple and true. 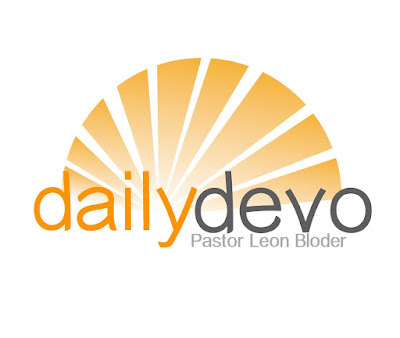 More often than not, when I am reading through my various devotional books and daily Bible readings, I find connections between them, recurring themes, if you will, that speak to me in the moment. Today was one of those days. For some reason four out of the five readings I had today all centered around what it means to pursue things that matter, the things in life that will last. I read from the book of Ecclesiastes, where the Teacher wrote, "I have seen all the things that are done under the sun; all of them are meaningless, a chasing after the wind." Recently, my wife and I went on a bit of cleaning spree, and decided to declutter some of our counters, shelves, the back patio, the outside patio, the kitchen, our closet, our bathroom, the kid's rooms... Okay, so we starting decluttering and just couldn't stop. What we discovered in the midst of all that decluttering was that we didn't really need all of the things that we thought we needed when we moved into our house several months ago. And here's the kicker: We actually thought we had decluttered from our old house when we moved into the new one. In fact, we hadn't--not really. But when the counters were cleared, the patios made a bit more sparse, all of the extraneous stuff that populated our kitchen, our closet, bathrooms and kid's rooms disappeared, we made a fabulous discovery. We felt better. Many of us have heard that old aphorism, "It's not the destination, it's the journey." How many of us, however, really know what it means? On the surface it speaks vaguely of the importance of being present in the moment, rather than focusing solely on what comes next. But there's a deeper meaning to the aforementioned phrase--one that I believe eludes most of us. I think this phrase speaks directly into the frail and finite ways that most of approach our goals in life. We find ourselves longing for someday. "Someday," we tell ourselves, "I'll finally figure out my purpose in life." "Someday, I'll have enough money to do what I want." "Someday, I'll get that promotion... reach that milestone... find my dream job..."
"Someday, I'll get healthy... get moving... do that thing I've always wanted to do..."
I'm going to spend the next couple of days thinking about what it means to simplify your life. It's been on my mind lately as I've been preaching on the vision of our church, and talking at length with church members and staff about the importance of a simple, clear vision. Years ago, when I arrived at the church I've been serving for the past eight years, I discovered that church leaders had created a "mission" statement some years before I got there. It was a paragraph long, at least filled with all kinds of ideas. At one of our elder meetings, I asked if anyone could recite the mission statement of the church. No one could tell me anything about it. At last, one elder (who had served on the team who created it) managed to come up with one part of one sentence. Years ago, when I was in seminary, I served as the youth director of a large suburban Chicago church. Because the church was located to a very high crime area, it had a pretty stringent security process, which required someone to staff the front entrance and screen whoever was trying to enter. During the day, there was a paid staffer monitoring the entrance, but in the evenings it was zealously guarded by a particular volunteer. This volunteer--I'll call him Bob--was an older man, with a not-so-convincing gruff demeanor. Bob was a big guy, and even though he'd stooped some with age, he still set an imposing figure--albeit, one that was pretty soft around the edges. Some years ago, I had someone ask me if I thought their family was cursed. They related to me a litany of horrible things that had happened to family members over the course of the previous year. It was one awful thing after another. My instinct was to tell them, "It sure seems like it." There was no good explanation for why so many bad things had come their way. But I sure understood their need to find a reason for them--to discover some kind of meaning in their suffering. I simply told them that sometimes things happened--it didn't have to do with a curse. I remember reading something about this in Philip Yancey's great book entitled "Where is God When It Hurts?" Yancey addressed the way that so many of us seek answers from the Scripture to help us understand why we are suffering, but we don't always get the answers we're looking for. I was reading one of the daily devotional books that I read nearly every day, and a passage of Scripture quoted in the reading caught my eye. In this passage from Genesis chapter 24, the servant of Abraham is speaking, and he says the most incredible thing about his journey to find a suitable wife for Abraham's son, Isaac. The servant of Abraham says, "...As for me, being on the way, the Lord led me..." (Gen 24:27, NKJV). There are other ways to translate that verse, to be sure. "The Lord led me while I was on the journey," also works. You might be wondering why this verse is remarkable. Think about what the servant doesn't say. He doesn't say, "I waited to start my journey until I had clear directions from God." He doesn't say, "I wanted to be careful about which way I went, so I waited until I knew for sure where God wanted me to go." The Road Of Life: Joyride or Joyless Commute? My mom was going through some of her keepsakes the other day and found my very first driver's license among them. She brought it over to my house to give to me, and I've had it sitting on my desk the past day or so--a glaring reminder of how old I've become in the past 31 years since it was issued. That kid in the photo had a defined chin, and a nice thin neck. He had a full head of hair, to boot. Honestly, I can't even remember what I was thinking when that photo was taken. I do remember the feeling of freedom I felt when I took my parent's car out for my first solo drive later that day, though. Funny isn't it? I can't recall much of what was happening in my life when I turned sixteen, but I remember that feeling of freedom when I drove slowly around my neighborhood looking for some girls to impress. 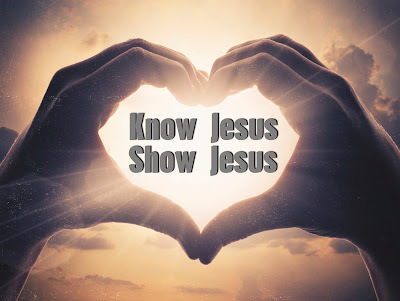 This week we are concluding the sermon series on the vision of our church that we started three weeks ago--a sermon series entitled, Know Jesus, Show Jesus. That is, in fact, our vision: To Know Jesus and to Show Jesus. Every year for the past seven years I have preached at least once on the vision of our church and/or on our core values. Our vision is to Know Jesus and to Show Jesus to the world--that's the "Why" we do what we do, why we exist, etc. Our core values, what we call the 5 Things are the "How" we accomplish all of that. You might wonder why we need to go over these things again and again. We need this now more than ever, sisters and brothers. We have a lot of new folks who are just figuring out what our church is all about, and we need to share with them why they felt so strongly that God was calling them here. Plus, we need to practice well how to live into our vision because--as my coach used to tell us--you play like you practice.